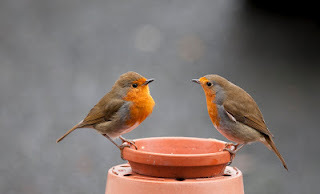 "I've decided the two robins on your bird-table aren't gay," Rachel tells me, over a coffee in her office at the university. "I never thought they were," I tell her. "They're just good friends." "Maybe more than that," she says. "I have it on good authority that male and female robins are pretty much identical. Robins are fiercely territorial, so if yours are getting along fine, they're probably Mr and Mrs."
"When you say you have it on good authority, you mean you've been talking to some guy in the pub again, haven't you?" I say. "Yes he was a guy. And yes we were in a pub at the time. But he knew what he was talking about. He was a real geek." "Means he can't tell the difference between male and female humans, never mind robins. How come you don't believe anything I tell you, but you'll take any old tosh from random punters in pubs?" "He was a bird expert," she insists. "Kept budgies and canaries and knew about bumblefoot and psittacosis." "Bumblefoot?" I say, slightly louder than I intend. "Keep your voice down," she whispers. "There's people in here trying to work. We should go outside if you're going to start an argument." "I'm not going to start an argument. I just like to get the facts right. Whereas you are just a teeny bit gullible." The two lines between her eyebrows tell me I've said the wrong thing. But before I can dig myself out Diane appears at my side. "Are you upsetting Rachel again?" she says. Tall, decisive, good-looking, Diane is head of the group Rachel works for. Takes no nonsense and makes strong men cry. Also me. "Be nice to her," she tells me, slapping me on the back and walking away. I glance at Rachel and notice with relief that the lines are gone. Quick to forgive, she stays annoyed with me less than anyone I know. Usually. Means it concerns me more that she might, though. "Are you all right?" she asks. "You look worried." "She's cracked a couple of my ribs," I say. "Ah, it hurts." "Don't be such a girl," she says. "So if my robins are male and female, they'll be starting a family soon?" I say, giving her a soothing chance to share more geek-given info. "Then making their nest," she says. "Which robins do just about anywhere - sheds, kettles, boots, coat pockets, car bonnets, hanging baskets. They're not fussy." Diane strides past again and nods slightly when she sees we're in calm waters. "She's like a protective mum, isn't she?" I whisper to Rachel, who goes quiet for a moment. "You should use that," she says. "Arouse her maternal instincts. Robins are fierce but they're great parents. They often feed other birds' chicks. Act like a chick and Diane will treat you better." I stroke my chin. "Maybe," I say. "But taking lessons from nature is risky. She might be a praying mantis, not a robin. The female bites the male's head off." "Only after mating," she reminds me. "If you don't mate with Diane you should be safe." "I'll try hard not to," I tell her.